A lovely housewarming gift for new house owners who are coffee or tea lovers, the Kona large 8 cup glass French Press Coffee Maker with stainless steel filter serves one large size (32 oz – 34 ounce, 8 cup, 1 liter) borosilicate glass carafe pot of aromatic coffee. The Kona French Press with its extra thick clear heat resistant borosilicate large glass pitcher has a most unique pleasing designed outer insulated shell. This outer shell helps in protecting the glass carafe from accidental chips and cracks. The BPS / BPA FREE lid is designed in such a way that the hot coffee or tea are not in contact with the lid when steeping the hot brew. The ergonomic and comfortable handle allows for effortless pouring. Added to this, the easy to use metal plunger with the rubber knob makes using the Kona French Press personal coffee maker so user-friendly. 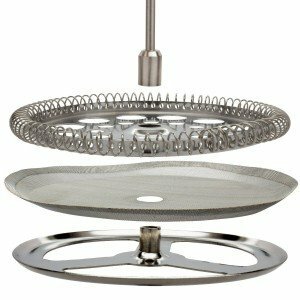 The detachable stainless steel filter screen infuser system makes for easy cleaning. stainless steel infuser filter system ensures that essential oils from the coffee beans are not lost on any paper filter. You get a rich and bold cup of aromatic delicious coffee every time. Having a cup of rich gourmet coffee every morning before setting out for work is so easy with this portable French Press coffee maker. Steeping time is just 4 – 5 minutes. 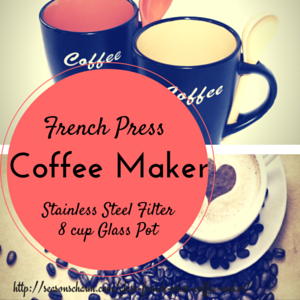 If you are looking for a French Press travel coffee maker, then this is great. You can bring along this portable coffee maker to the office, whenever you travel or even when going on camping trips in the wilderness. No electric power is needed, it operates with you slowly pushing the metal plunger down the glass carafe pot. Yes, the Kona large 8 cup glass French Press Coffee Maker with stainless steel filter housewarming gift will be much appreciated indeed.